Most of us have heard of hops because they are one of the main ingredients used in beer brewing. They give beer that classic bitter flavor, and in some varieties it can be quite pronounced. Since I love to make my own brews I’ve been curious about growing hops for a while now. Earlier this season we bought a start at the farmer’s market, plopped it in the ground, and it was off and running in no time! 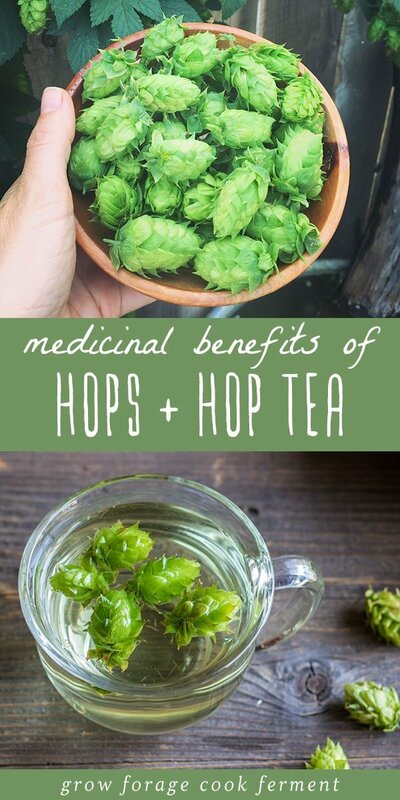 But did you know that hops also have numerous health benefits and can be made into a tea? I was so happy to learn about the medicinal benefits of hops and hop tea, and now I want to share that with you! Hops (Humulus lupulus) are in the Cannabaceae family, which is the same family as cannabis and hemp. One great thing about hops is that they are very easy to grow. They are a “bine” plant, which is similar to a vine but has a different growing habit. They are perfect for growing on a trellis, arbor, along a fence, or even on the side of a house or barn. Hops do have a tendency to take over a bit, so feel free to prune freely if they are going where they shouldn’t. Hops are perennial and will die back to the ground each fall, coming back up in the spring. 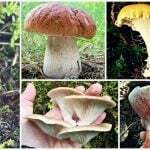 This makes them good for growing as a natural shade provider in the summer when you still want to allow the sun to come through during the winter. 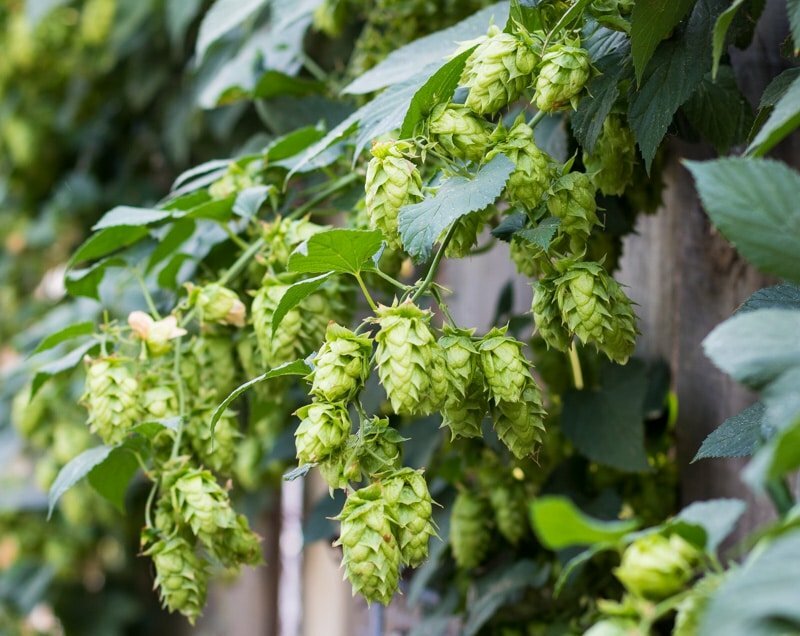 The pale green hop flower cones are what is primarily used for most applications, including brewing beer and for medicinal uses. Learn more about growing hops and harvesting and drying hops here. While hops are well known as being a bittering agent and natural preservative for beer, they are less known for their awesome medicinal benefits. 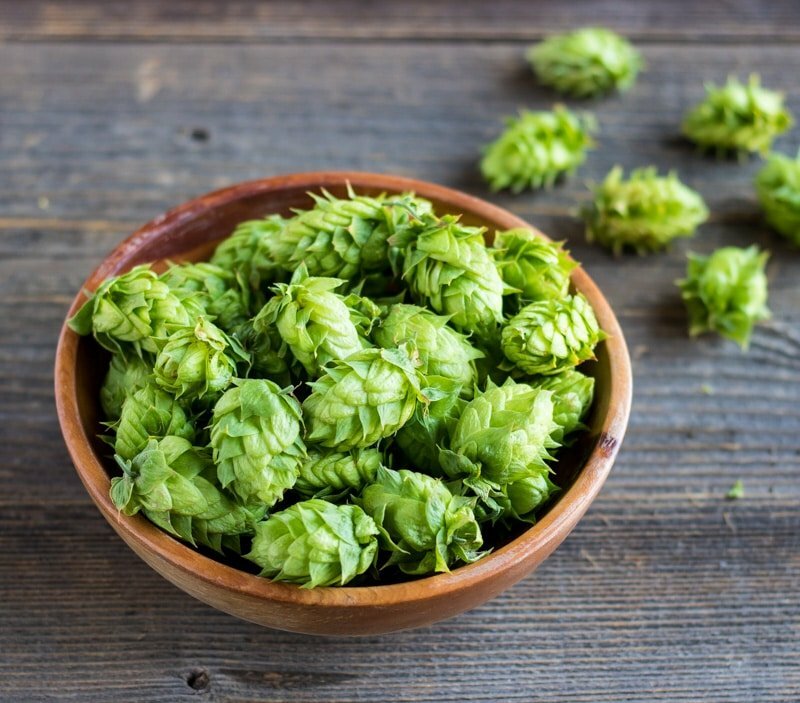 Here are some of the powerful health benefits of hops. 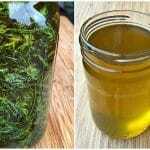 The most common ways to take hops medicinally is as a tea, tincture, extract, or in capsules. 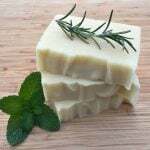 For aromatherapy you can try hops essential oil. Probably the best medicinal use for hops is as a sleep aid. 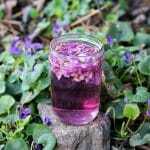 It is a relaxing sedative herb and is particularly effective when combined with valerian. Hop tea, tincture, or capsules can be taken before bed to help with sleep. 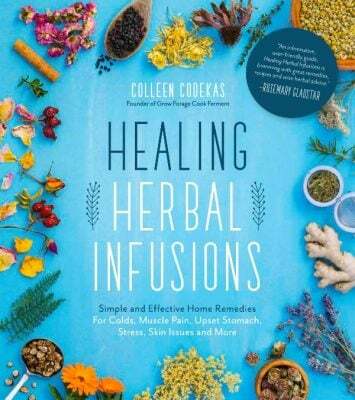 You can also make a sachet using dried hops and other calming herbs like lavender and chamomile to hang by your bedside. You can even make an herb pillow using hops flowers to help you sleep. If you don’t want to make it yourself you can buy a hops pillow here. So that’s why I always feel sleepy after a very hop forward beer! Several sources say that hops should be avoided by those with more than mild depression due to its powerful sedative properties. Being a bitter and tonic herb, hops help to ease and stimulate the digestive system. Hops are perfect for making into digestive bitters and are best taken before a meal to stimulate the appetite and help with digestion. 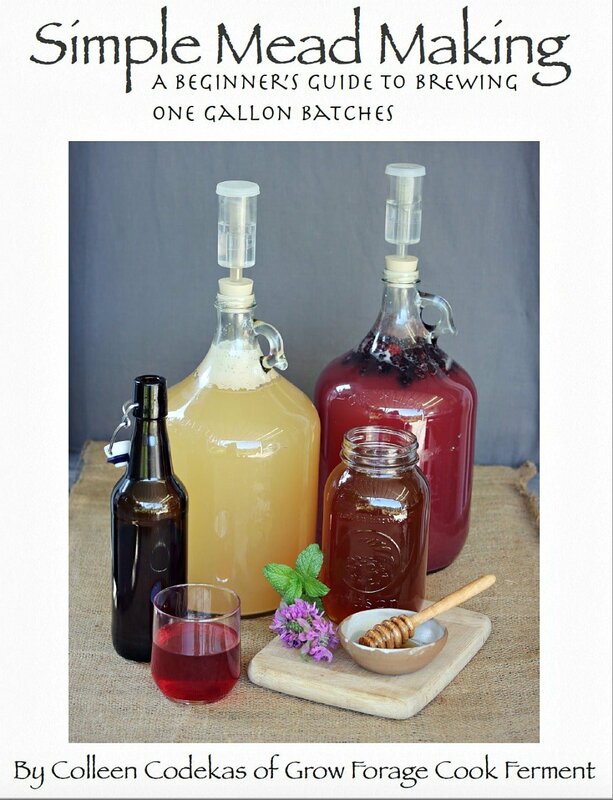 You can then use those bitters to make hop cocktails! Drinking hop tea is another way to use hops for digestive issues, see how I make it below. Amazingly, hops are also a powerful immune system booster! 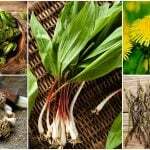 They have antiviral, antibacterial, antimicrobial, and antibiotic properties. Brew up a batch of hop tea when you’re feeling a sickness coming on, or take a few drops of hop tincture to shorten the duration of a cold or flu. Hops are high in anti-oxidants making them excellent for the skin and hair. 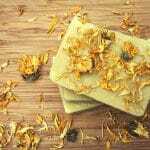 They also have anti-inflammatory benefits, so are useful for calming rashes or inflamed skin. 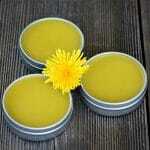 They would be excellent to use in an infused oil or herbal salve for skin conditions. When hops are used on the hair they help to treat dandruff and flaky scalp, and can even help with hair loss! Some people claim that using a beer rinse makes hair shiny, likely due to the hops. Hops are perfect for men’s beard care as well! 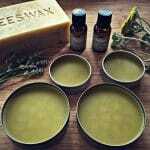 Check out these awesome hops beard products on Etsy, or you can make this cedarwood and hops shaving soap. These soaps made from beer sound really cool too! They are also good for healing minor cuts and wounds. Try making a hops poultice next time you you have an injury to help speed healing. Hops have historically been used for women’s menstrual problems and also for women who are in menopause due to the high level of phytoestrogens they contain. They are effective at reducing the symptoms of premenstrual syndrome by reducing irritability and soothing cramps. For menopausal women hops help to naturally regulate hormones, ease hot flashes, and calm nerves. Because of its phytoestrogens hops should not be taken by pregnant women or young children. Making hop tea is probably the easiest way to use hops. 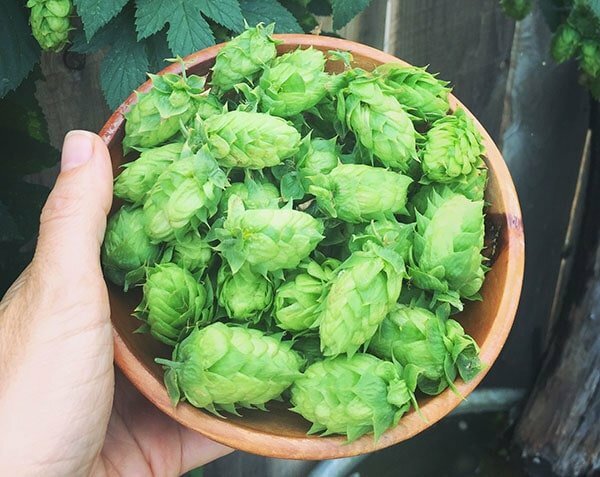 Since we grow our own hops I prefer to use the fresh green hop flower cones when I make tea for the best flavor. But once the season is over I pick what’s left and dry them for later use. 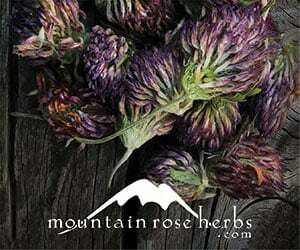 You can purchase dried hops from Mountain Rose Herbs, my favorite place to get high quality organic herbs! 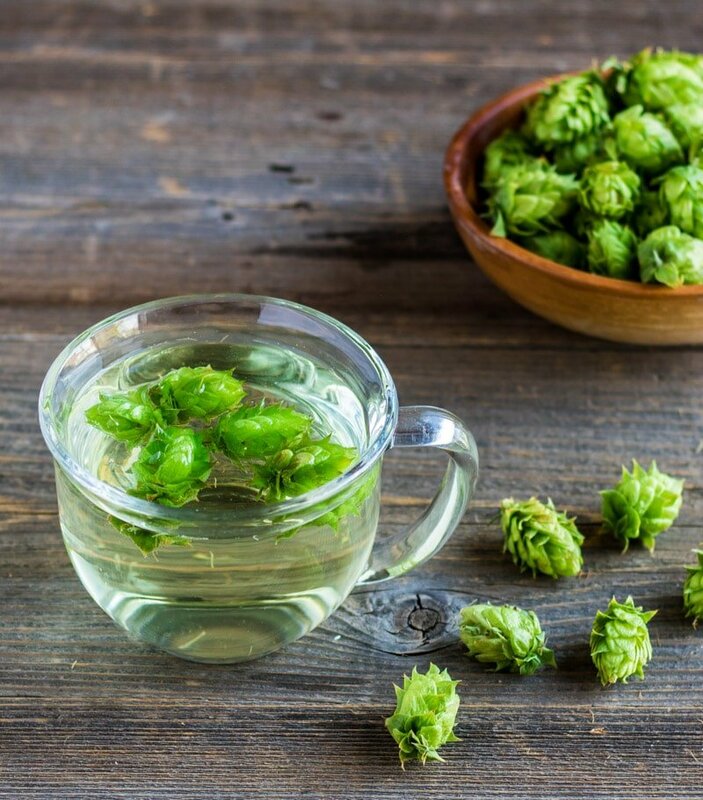 To make hop tea, simply pour two cups boiling water over 5-10 hop flower cones. The more hops you add the stronger, and more bitter, it will be. I found the bitterness to be quite mild and not bad at all, but everyone has different tastes. 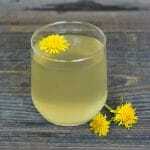 Adding other herbs like chamomile or peppermint will help with the flavor if needed. As you can tell, hops are pretty amazing and have some great medicinal benefits. 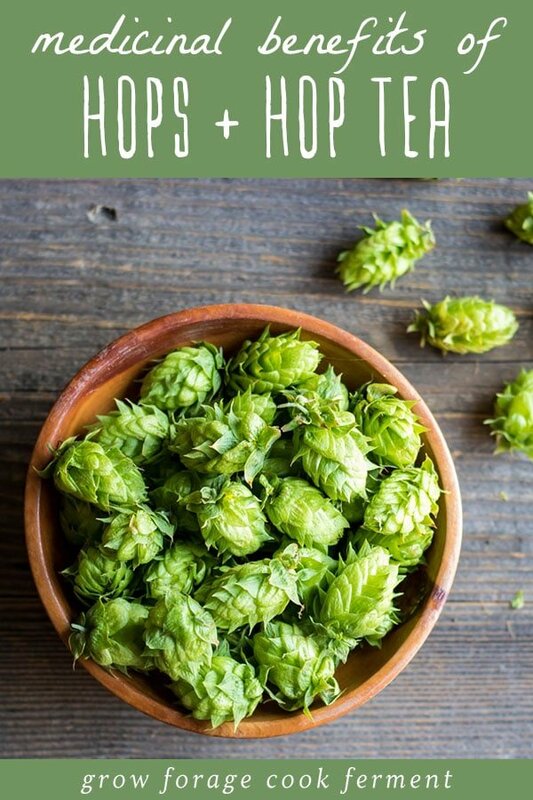 I hope this post has inspired you to use hops for your health, even if it means drinking an extra hoppy beer before dinner tonight! Hops have many health benefits and are perfect for adding to your herbal apothecary! 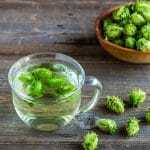 Learn about the medicinal benefits of hops and how to make hop tea. Pour the water over the hops flowers. Allow to steep for 5-10 minutes. Strain the cones and sweeten the tea to your taste. The more flowers you add and the longer you steep, the more bitter this tea will become. When is the best time to harvest the hops flowers? Is there any benefits to using the leaves? Brewed first batch of hops tea, used my coffee French press, full of water, 5 min micro to heat water, then put in apx 10 hops worth of crushed flowers, let steep for 4 hours along with 3 drops of peppermint extract. 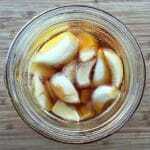 Poured over Ice, and had a wonderful iced peppermint hops tea. 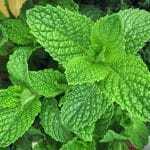 I am brewing another batch that I will put in my carbonator to create a peppermint hops soda. Peppermint smoothed out the bitterness but any bitterness is worth the health benefits. Does it taste like beer? 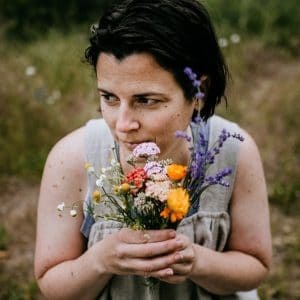 My husband is 3years sober and would benefit from the tea, but not at the expense of cravings resurfacing. In my opinion it does not. I hate beer, the hops are very bitter, but not in the same way as beer. I suppose if he drank very “hoppy” beer it might have a similar subflavor, but hops tea tastes nothing like regular beer. Hi Amber, I don’t think it tastes much like beer. Just a mild bitterness. Try a new refreshing beverage brewed in Bend. Oregon Hopwater. Oregon Hop Springs LLC. A carbinated refreshing drink, canned for easy transport to your favorite outdoor activity. 0 alcohol, 0 calories Your husband will love it! Really interesting article. Living here in Oregon it would seem that there would be a local source for hops. I wish I could “you pick” some somewhere in the valley. 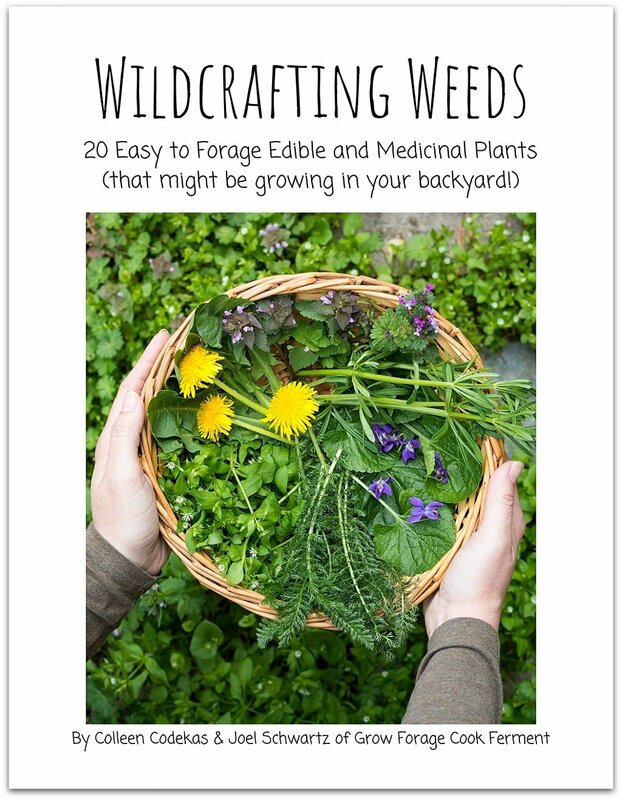 Seems like a must have for the herb pantry. I know so many people that have sleeping issues. 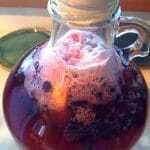 BTW I made some fermented elderberry honey yesterday. Thank you.